"Self-care needs to be included in what you are doing. It's not a privilege, it's a necessity"
It's a tough old world out there and we often talk about our brain having too many tabs open! It's a great image and it's totally true. It can sometimes feel like we have too many plates spinning or we are juggling too many balls and this is precisely when it is even more important to take some time out to de-stress. Over the past couple of years, we have featured some beautiful products that help to calm, restore and de-stress the mind and body. We have put each one to the test (#perksofthejob) so we can vouch for how amazing they are. Let us guide you through our Top 10 ways to de-stress - first-up, Tea! It could only be tea first, right and our lovely buddies over at Tea Huggers have created a 'chill out' tea to rival all others! It combines a gorgeous mix of strawberry, basil and chamomile. Chamomile can help to reduce stress and anxiety as well as promoting better sleep. We give this tea a huge thumbs-up and here's to a gorgeous night of sleep! Exfoliate, exfoliate, exfoliate! That's the advice I've always been given. Sloughing-off the day in a really gentle way can work wonders! Your skin will be sparkling and it'll revive your body, too! A good bit of body-brushing also never goes amiss! So, run a hot bath, take a soak and exfoliate with Optiat scrub or even our Daily Concepts Scrubber. They have the most delicious-looking product range and we are totes in-love with their scrub-a-dub-dub range! So, put your best mitt forwards and scrub-away the stress of the day. A nice, long relaxing bath can work wonders for de-stressing - it can have a really calming effect on the mind, body and spirit! A long, (not too hot) bath can help to relieve skin complaints, reduce muscular pain and help us to get a better nights sleep. We have another perfect addition to your bath ritual; our Seacret Dead Sea Mud Soap has all the skin-cleansing, mineral-rich properties to give your skin a healthy glow. It is most definitely part of our bath-time repertoire and we love it. After a busy day, (especially with it being so hot at the moment #needtodrinkmorewater), it's a great idea to make a meal plan for the week. Allocating a chunk of time once a week to plan what's for dinner for the coming week can save both time and money. Also, being organised with meals can take a lot of stress out of your daily routine. We featured our in-house designed, exclusive to TreatBox Meal Planner in our May box and it went down a storm! There's a cute Shopping List section so you'll never run-out of all your essentials! We are great believers in the power of positive thought and affirmations. If you surround yourself with positivity and let the positive thoughts run free, we really can change the way we feel. This can all lead to us feeling more grounded, less stressed and more able to live our lives happily! We carry a set of affirmation cards with us (in our purse) so we have little reminders every day to make us smile. Breathe, Believe, Smile, Calm. It couldn't be simpler! We are eternal note-makers/takers/jotters and at any one time, we've been known to have about 10 notebooks on the go! It's good to write things down, jot-down plans and our hopes and dreams. It can really help to focus the mind, make sense of things and help us to get organised! There's nothing better than writing a 'to-do' list and ticking things off as we accomplish them. We love a list! This can really help to calm the mind and give structure your day which when put into practice regularly can make us feel much more centred, aligned and ready for action! Oh, and did we mention that we have the most delicious array of exclusive to TreatBox notebooks? They are amazing! Ok, so, let's get down to business. It's sweet treat time! No de-stressing pamper session would be complete without something sweet. A little bit of what you fancy now and then goes a long way in terms of de-stressing, a lovely choccy bar alongside a cuppa is the ultimate pick-me-up tag-team! We have lots of delicious treats to satiate all the choccy-lovers out there! If you're more of a 'penny' sweet (#showingouragenow), our pick-and-mix bags have literally got it all going on! Even though it's summer, we still LOVE keeping our feet cozy. De-stressing the body and mind is all about winding-down, putting on the breaks and taking a load off. So, if you have a movie night planned or if you're having a bottle of wine with the girls, make sure that your toes are toasty! 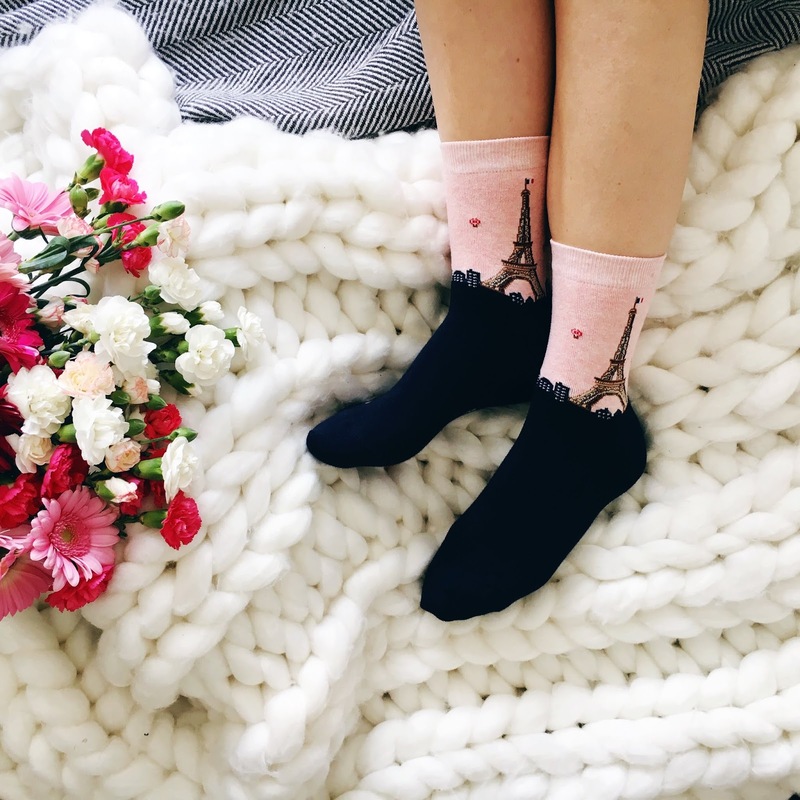 We featured some amazing Eiffel Tower socks in our July box - they are the softest socks we've ever laid our hands (feet) on! Creating a cozy, calm and quiet space is a great way to help the mind re-charge. Another way to promote a sense of calm and de-stress is to book in for a manicure! Or, if you don't have the time, an at-home mini-mani is a great way to de-stress. If you have a loved-one who wouldn't mind giving you a hand massage, then even better! A bit of contact whether it's a massage or a huge hug, it has been scientifically-proven that when we hug a fellow human being can increase serotonin levels (the happy stuff). Hugging, as well as laughter can heal, reduce stress and anxiety and improve our overall sense of wellbeing. Awwww, anyone fancy a hug? If you'd like to partake in the at-home mini-mani, we have the BEST cuticle oil to keep your nails and hands oh-so-soft. Right then, now that you have de-stressed and given yourself some much-needed time out, there's only one thing left to do! Yes, that's right - it's slumber time! We reckon that after ticking all of the above off your de-stress checklist, you'll be primed and ready for the best nights' sleep EVER and we all know that a 8 hours in the land of nod (if we can get it) is the best remedy! We hope that you like our Top 10 ways to de-stress! We would love to hear all of your hints and tips for de-stressing too so please let us know and we will most certainly try to incorporate them into our daily routines, too. That's it for now, a wrap, finito, we're off to bang out some ZZZZZ's.